Your safety and comfort are of paramount importance here at Ria Family Dental. In all our dental procedures, we never compromise patient safety. Hence we invest in top of the line dental equipment for better results, optimum performance, and increased customer satisfaction. At Ria Family Dental we use digital X-rays for all our X-ray needs. This device emits lower radiation levels compared to its variants, making it safer and more compatible for children and pregnant women. Checking your mouth for any possible oral problems means checking even areas that are not seen by the naked eye. To do this, an X-ray is needed. X-rays create a detailed picture of your mouth and give your dentist the necessary information needed to go forward with treatment. An X-ray can show the status of the teeth, gums, jawbone, and supporting tissues in the mouth for your dentist to arrive at a diagnosis. A dental X-ray is performed only when needed. 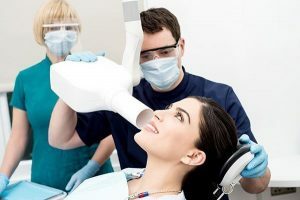 Not all dental check ups will include a dental X-ray so don’t be surprised if your dentist does not set you up for one. All will depend on your current oral health status, although dental X-rays will be taken more often for children compared to adults. This is because children’s teeth and jaw are still developing and need monitoring; plus they are more prone to tooth decay since they are still not good brushers. Yes. A dental X-ray is safe even for pregnant women. The radiation levels are too low to cause any harm to the developing child. Still, it is better to tell your dentist if you are expecting or are planning to conceive. We take extra measures for such situations. Pregnant women are given a leaded apron and thyroid collar during the procedure. Some pregnant women forego dental visit during pregnancy. But your oral health needs closer attention during pregnancy than ever. The event weakens your oral defenses due to hormonal changes in the body. This can lead to development of new dental problems or a worsening of existing ones. At Ria Family Dental, you are our number one priority. We are a patient-centred dental facility and that means your safety isn’t compromised under any circumstances.